We are quite late getting this up this year, so we thought we’d save this lovely account of this year’s trip to Kenya by our own Leah Warren for when the coffees land! Shout at your Account Manager on all sides of the ponds to hear more about our newly landed blackcurrant bombs! And read the account below of Leah’s trip in February…. This year’s trip to Kenya was a whirlwind trip: 5 days on the ground, half cupping and half visiting friends old and new in Nyeri, Murang’a, Embu and Nairobi. We started off very early Sunday morning with the obligatory safari in Nairobi National Park. With the tall buildings of Nairobi hovering at the Northern edge of the park, it is hard to believe that you are actually in a wildlife haven. If you get there early enough, however, your first sighting of a hunting lioness will divest you of any urban notions! Finishing off the day at the David Sheldrick Elephant orphanage is a great way to round off your introduction to Kenya’s amazing animal inhabitants and a really lovely way to fight off the jet lag. Day 2, it was back to coffee. We started with a visit to one of our partners, Taylor Winch. This gave us the opportunity to cup dozens of coffees and selected some favourites. Iriguini AA ( Murang’a), Ngugu-ini AA (Kirinyaga) and Kiandu AB (Nyeri)are recently landed in North America and UK markets. Some may already be sold out by the time you read this, but if not, they are worth a look! In the afternoon we visited Taylor Winch’s warehouse in Nairobi. Here we had first glance at the intricate systems for cataloging and sorting green coffee for export. Clean, well-organized, efficient, and run by one of the few female Mill managers in Nairobi (Dainah Gatakaa) the set up is impressive and well-laid out for exporting high quality specialty coffee. Tuesday, we headed off to Auction. Held every Tuesday during the harvest season (for something like 40 weeks a year), the Nairobi Coffee Exchange has been going in some form since 1933! Visiting the Sample Room at the Nairobi coffee exchange never ceases to amaze. Literally hundreds upon hundreds of Kenyan Coffee samples are offered at auction every week. All auctions are aligned with the early and late coffee crops. Early crop is September to December, late crop is May to July. We had the opportunity to witness the auction, which frankly was a little quieter than expected. Still, remembering the lives impacted by these sales quite vital. Even though direct sales were enabled through the establishment of the ‘second window’ in 2006, the vast majority (85+%) of Kenyan coffee is still sold through the auction. 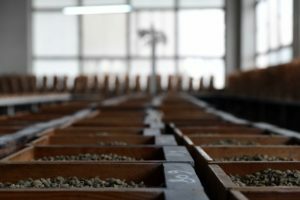 During our trip we saw exceptionally high prices for top lots, and many will ask why the pricing seems to continually go up for Kenyan coffees. Some would suggest that the encroachment of urban areas on coffee estates, farms in proximity to Nairobi mean that coffee production is diminishing. Certainly weather instability, issues with disease, increasing labor costs and the cost of inputs have all worked to challenge production in Kenya, which has been on the decline since 1989. All that being said we found exceptional lots from various regions that certainly deserve the high prices that are being passed on, to a large degree, directly to the growers; growers seem to be increasingly aware of the value of their product and directly demand the higher prices they get! Following the auction, we traveled up to Rukera Farm in Kiambu. Rukera and its sister, Jacaranda, which adjoins it, are the test farms for the Coffee Research Institute previously named the Coffee Research Foundation. The Institute has a directly lineage with Scott Laboratories, who were responsible for developing Kenya’s ‘SL’ varieties as early as the 1930s! Here we had a chance to tour areas where varieties are grown for experimental purposes and also saw where the institute grows seedlings that they offer for sale to support their projects. We even had a chance to see some Kenyan Robusta – along with the ubiquitous Ruiri 11, Batian, SL28 and SL34. Our next stop was Eaagads Estate, a fine producer of Kenyan coffee also located in Kiambu. The farm was founded in the 1940s and has recently been placed under new management. Work is ongoing to mitigate the issue of low yields, disease, climate change, price volatility, etc. The farm has produced amazing lots in the past, and it is great to see that additional attention is being put in to make sure it stays productive, when so many Kiambu Estates have been sold for development. We saw a lot of pruning and application of mulch, and in April new planting will begin. Wednesday saw us off to Embu and Murang’a with a layover at the famous Tree Tops Hotel (where HRH Elizabeth ‘went up a princess and descended a queen). From the viewing window over the watering hole (coincidentally located in the bar area) we witnessed the midnight arrivals of hyenas, water buffalo and impalas. In previous years, we’ve seen the Elephants arrive to stop around and the hotel has the option of giving you a wakeup call if one of the big five rock up. In Embu, we met with three local farmers working with a cooperative Ececo Ltd. This is a collaborative effort to improve the quality, yield and expertise of small farm holders. 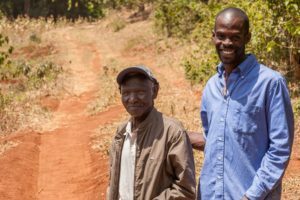 Samuel Njue, part- time coordinator, works diligently to assist the farmers with their needs. Jamken Estate, owned by Mr. Alfred Miriti, also chairperson of the collective, has over 10,000 trees planted. Later the same day we visited Jane Jeru Ngiru at Mutara Farm. Jane is a widow with 5 children. She has 7,000 trees on her estate and has started irrigating due to fluctuations in weather patterns. Finally, we stopped by Wangaki Estate owned by Dr. Francis Kihanda. With 22 acres under coffee (10,500 trees), he is able to have, 6-7 acres alone of SL28. We didn’t purchase from this farm this year but we will keep an eye out. 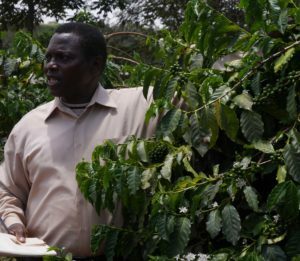 Single varietal lots are rare in Kenya, and if the capacity is there it is one to watch. All of these farmers were extremely excited about the opportunity to work with Taylor Winch, who offer guidance on marketing and coffee management. 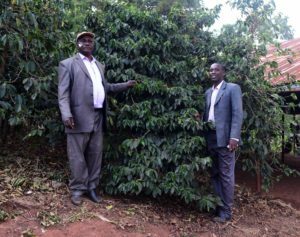 Farmers always also can rely on the Coffee Research Institute and their selected Marketing Agent  for the year to advise them on the best way to develop great Kenyan coffees. Our trip up country rounded out with a visit to a favorite of ours: Iriguini Factory (as wet mills are known in Kenya). Both an AB and a PB lot from this well-regarded factory have just landed in North America and we are excited to share them with our customers as they are fabulous. Iriguini is one of 3 factories (one of which is dormant) operated by Marumi Farmers Cooperative Society. Ltd. The factory itself was founded in 1988. The current association has something like 1,500 farmers, but 450 actively delivery cherry to Iriguini. Chairman Mburu KW Francis and Secretary Manager Peter Irungu Kimani gave us a tour of Iriguini. The factory sits at 1,843 masl, and water for fermentation and washing must be pumped from the Icharuhonge river 250 meters below to the factory. Farmers deliver coffee on motorbike, car and on their backs. Despite all this work and the very small farm sizes of the members, they produce 27 tons of clean coffee annually. Our final day was a full day of cupping at C Dormans. 180 coffees in a single day. That’s the way it’s done in Kenya…. taste then move on. How else will you get through that massive weekly auction catalogue?! Dormans also has ties with the Marketing Agent, CMS, which means that they also have the pleasure/responsibility of presenting direct trade lots to their customers. Raphael Prime, who is head of specialty coffee at Dormans, cups and scores thousands of coffees a month. He knows our tastes, as he also used to be a colleague! There we found some of our old favorites Eaagads, Nyeri Hill and our newest gems, Mchana Estate and Kiunyu. These lots are now in store in the USA. Kenya never disappoints: Safari, baby Elephants and some of the world’s finest coffee. What more could you ask for? There are currently 6 or 7 marketing agents operating in Kenya. Marketing agents are selected by the cooperative/estate and work to represent them and their coffee on a contract that must be renewed annually. The agents are responsible for: ensuring presentation of coffee in the auction OR negotiating appropriate prices with direct buyers; preparation of the auction catalogue; setting of reserve prices; and selection of an auctioneer. Marketing agents may also sometimes provide technical assistance and advice during the harvest season – particularly if the marketing agent facilitates direct trade/relationship coffee. Coffee Management Systems (CMS) was the innovator of this system, though other agents provide these services now, as well.